A monument to honour those who attended residential schools in Canada was unveiled Winnipeg near the Canadian Museum for Human Rights. A monument to honour those who attended residential schools in Canada was unveiled on Monday near the Canadian Museum for Human Rights in Winnipeg. 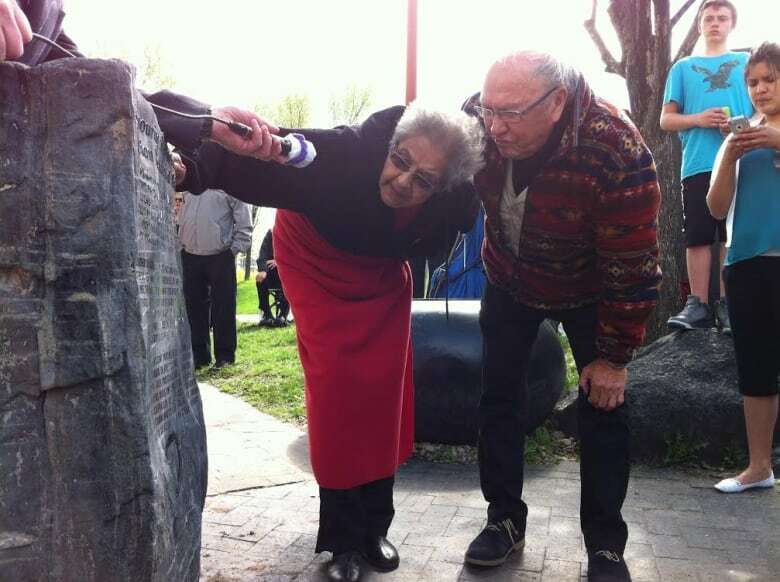 The engraved stone monument, located at the Peace Garden outside the museum, was first suggested by an elder who was a residential school survivor. Nelson James of Roseau River had called on the federal government to erect something in tribute to those who attended residential schools before his death five years ago. James said such a monument needed to be in a public place where many would see it and gain an understanding of what happened in that dark part of Canada's history. As a result of their experience at residential schools, many survivors returned home without their language and limited understanding of their heritage and spirituality. Many did not know how to parent and many fell victim to alcohol, drug addiction and crime. According to the national Anglican Church website, during the century following Confederation, there were an estimated 80 church run, government funded Indian residential schools. The purpose of the schools was to assimilate First Nations children into the European lifestyle. Children were abused sexually, physically, emotionally, culturally and spiritually. Some did not make it home. Survivors of the schools eventually launched a successful lawsuit that resulted in a Canadian apology and the birth of the Truth and Reconciliation Commission in Canada. Elder Sylvia James, one of a group of four partners that brought the monument to reality, said watching it being installed was a powerful experience. "We were witness to reconciliation taking place," she said. "It was an awesome feeling watching this unfold." The monument itself was a gift from David Bohn of Larsen Memorials and a member of St. Paul's Anglican Church. "David dug a hole to set up the rock. When I looked into the hole I was reminded of the hurt, shameful damaged awful dreams being laid to rest and new beginnings for new life coming up," said James. "We are sending the nightmares away and beginning the healing journey in remembering those who didn't get a chance to witness this." The monument is located at The Forks, a historic site at the confluence of the Red and Assiniboine rivers where First Nations people gathered for centuries and then met with European fur traders, and where Winnipeg first began as a settlement.